This year for Thanksgiving, I had the idea of bringing in cute printouts that posed the question, "What are you thankful for this year?" Our volunteers wrote down the responses from the seniors. They were both heart warming and humbling. Many seniors wrote about how they were thankful that they were still alive and that they were still able to be with their families. However, one lady named Florence said she was thankful for us coming and brightening her day. I don't think that before this moment I'd ever really thought about the impact that we have on their lives. 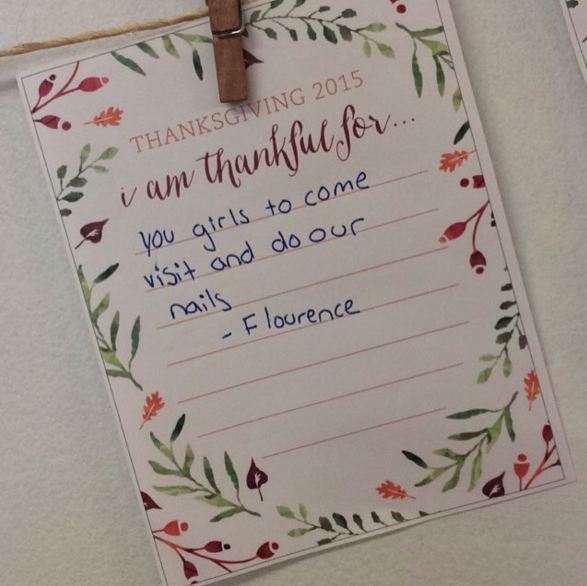 Hearing those words from Florence made me feel as though nothing in the world could be more rewarding then visiting theses ladies every month, just to see their smiles and hear their kind words. Check out more photos from this chapter's Thanksgiving makeover here!